Love Wins: Chapter 1 – What About the Flat Tire? Wow. That was a lot of questions. And if you’re anything like me, each one of those questions opened up a series of other questions. More to think about, more to ponder. By the time I was finished I didn’t know whether I should reread the chapter, move on to the next one, or curl up in a ball and hide until sunrise. 1) Of all the questions that Rob Bell asked in that chapter were there one or two that really struck a chord for you? Maybe it was a question that you’ve often wrestled with, or maybe something that shifted your entire paradigm. Let’s talk about those. 2) Rob also made some pretty strong inferences about certain aspects of church dogma alongside some of those questions. Did any of these push your buttons? Did any bring relief? 1 – What About the Flat Tire? 4 – Does God Get What God Wants? My copy of the book won’t arrive until Tuesday evening, but I’ll jump in as soon as I can. Looking forward to it! It’s killing me (now) not having the book. Should be here today or tomorrow! I think the question in the title is really what struck me… “what if your missionary gets a flat tire?” I think that I really did grow up with that idea that if missionaries don’t go to a place then those people never hear and are “lost” (really a nice way of saying damned). I always had a hard time with that. Especially when you combine the westernization of cultures that often erodes the innocence and the good in what the culture already had. (Which I realize is another problem altogether, and not really about after life hell but rather the here and now). The other question (that I can’t remember if it was spelled out or not, because I don’t have my copy with me at the moment)is what happens to people who are constantly fighting for biblical life, even if they don’t embrace it as such? The first person that always comes to my mind is the Dalai Lama. I don’t agree with him religiously, but he works tirelessly for peace and for the freedom of a people in the most humble way, and really has some wisdom. Am I to believe that as a leader of an “opposing religion” he’s going to be damned if he doesn’t acknowledge Christ in this life? Doesn’t seem right to me, but it’s what I’ve been taught growing up… sort of. This book is interesting to me because my parents are split on this idea, one believing in more of a “Great Divorce” situation, and one believing in Eternal Punishment. So I have gone back and forth on this subject for a long time. I think the question in the title is really what struck me… “what if your missionary gets a flat tire?” I think that I really did grow up with that idea that if missionaries don’t go to a place then those people never hear and are “lost” (really a nice way of saying damned). That’s what I grew up with as well. I grew up in a denomination that originally began as a missionary movement, and as such had such a huge emphasis on Christ’s “Great Commission.” Bringing the gospel everywhere. There was an urgency to it that was good. We’ve got to bring the Good News everywhere as quickly as possible to make sure people have a chance to hear it. That sort of thing. But as I’ve grown older I’ve found myself really struggling with the thought that God would condemn someone to hell who had never heard the Gospel. Never even had the chance to repent, accept Jesus, whatever you want to call it. Especially when you consider the fact that huge percentages of children in developing nations die at a young age due to a lack of medicine, clean drinking water, etc. So these people have the worst lives of anyone on the planet, then they get to be tortured forever in hell because missionaries didn’t reach their village? At some point, God began to seem very cruel. I still haven’t reconciled it. I think urgency in missions can be good, if it’s focused correctly. I definitely believe that life is more abundant with a knowledge of Christ, but that is based on my own experience. Part of why this comes up for me is because I used to think it was my job to save people. I understand now that I can’t save anyone. That’s not to mean that I shouldn’t share my faith, etc., but more to mean that I’m not sure that happens in the evangelical/mission minded way that I grew up around. Sharing faith is okay. It’s a part of who we are. But I don’t know if it’s what should define us. I think human beings are more interesting than their own religion. if we can just love genuinely that should be enough for people to ask us why? Or how can we be so loving and humble? When that happens, we can share our faith; because I think we’ve earned it. Why are we more interested in sharing about the gospel that we ourselves are so confused about? If we truly show care and love for one and other, we can trust that God will use that to spark someone’s interest to be more loving and true by our example. That way we don’t belong to any preconceptions. Cause God only knows half the preconceptions that come along with Christianity. I read the whole book, so I don’t know what the topic is really. I can just chime in once and a while. Sharing faith is okay. It’s a part of who we are. But I don’t know if it’s what should define us. I’m wondering if you wouldn’t mind expanding on that some more. I could see this leading to some key conversation points, but I want to make sure that I’m clear on what you mean by that. Based on the comments so far, I think I might honestly be the most theologically conservative. Thanks again for the invitation, Shane. But I should say that its not that I don’t think the questions or confusion on this issue aren’t important. Just that I don’t think God should be defined based on the answers to these questions. How could a good God send millions to hell? I don’t know. But I do know this: while we were yet sinners (that is, while God had every reason to condemn us all to hell, since those are the wages we earned), he had mercy and sent his son to die for us. I guess I’m more akin to think God is good based on the revelation he has given than by what he hasn’t. For this, this means I have to live in the tension of not really knowing the answers to all the questions Bell asks. And they’re great questions. But I feel like Bell made these questions THE questions that had to be answered and so imagined a God/conjured up answers in order to answer them. I really like that perspective. I’ve kind of come to a place in my own journey where I’m content not to know all the answers. So, there are some really big things that I can’t reconcile … and I guess that’s ok. But there are some things I do know. And this is a great example. Often times it can be better to focus on what is known than to toil in frustration over things we don’t. I imagine a conservative calvinist might say “the flat tire is God’s sovereign will.” I’m not part of that camp. I already reject eternal torment in hell, so that doesn’t motivate me to evangelize. What does motivate you to evangelize, and why? To be honest, I do not consider myself an evangelist. Contrary to the dogma of evangelicalism, I do not think that every Christian is called to do that “full-time” so to speak. Though I can speak of missions trip to Utah for/to the LDS. I was motivated by a belief that a missions trip is something every Christian should do at least once, a strong love for the Incarnation and other distictive Christian doctrines, and the belief that -bluntly put- that Joseph Smith was a con-artist. If I want to save the LDS from “hell” it is the hell of realizing that they’ve been duped for years and that there is nothing better to believe. Many LDS shrug that “eh.. its false, but there’s nothing else right?” or worse become very, very, angry individuals. I make no pretenses about being able to offer an essential definition of that term. I’m pickin’ up what you’re spilling, Jesse… the whole “We deserve hell so God giving us the chance of heaven” shows his love does seem to have some weight to it. At the same time, she says opening up more discussion, some might say that God makes the rules, and what kind of rules are they if everyone does not have a chance in this lifetime to win the game? I think my question for Joel would be what is your definition of evangelism? Then Shane’s question. Because my definition of what evangelism is changes or has changed. Well, I consider the process of conversion much slower than, the revivalist. People very slowly change their worldviews, especially when they are adults. Because of that my idea of evangelism is more about building relationships, than it is getting quick fast conversion. I also do not think that evangelicalism is about inviting a friend to church Sunday. Sunday, is for people who are already Christians IMO. If Evangelicism means “spreading the good news of the Gospel” than I think everytime someone donates to world vision or similar organizations is spreading the gospel. I can dig it, Joel. Although, I have known people to have quick initial conversions that only deepened in meaning as they grew in their faith… so I can’t discount that completely. I absolutely believe that Sunday Services are for people who are already Christians, primarily. Something that occurs to me is that I just don’t want to limit God. If he wants to work through a creepy televangelist, I’m down with it. He’s God like that. Also, it’s very important to me that different folks have different callings. I’m huge on relationship building and hospitality. Rob Bell’s gift is teaching (if you’ve ever talked to him in person you will know he’s not super pastoral in the mentoring sense), my husband is definitely an exhortative person. (I don’t think “exhortative” is a word, but I’m using it because it sounds how I mean). So while I think that evangelicism is not what it should be or needs to be, I think that there’s a lot of good in there I don’t want to throw out with the bathwater. (wow, random badly executed metaphor… I am on a ROLL this post). But I suppose the time is right for me to pick back up because I’ve been completely immersed in, and enjoy, this new dialogue. 1) If a pastor is God-ordained, and he disagrees with another pastor that is God-ordained, which is correct? The one that agrees with us? 2) Do you ever wonder if one of God’s decision hinges on whether or not you (personally) pray about the situation? IF SO… isn’t that scary? IF NOT… why pray? Ironically, I’ve had The Great Divorce sitting on my self for a couple years now and have yet to read it. Might have to chase this one with that one. Hello! I’d like to chime in every now again as well. But I’d have to say that the most eye opening question or section was when Rob listed all the different ways someone was “saved” in the New Testament. I remember as a kid saying the sinners prayer like 14 times, and so I found it quite interesting and really just created more questions!! I have already read through the book, but I went through it so quickly that I’m going through it one more time to see what i may have not grasped and so I love that I can be a part of this conversation. First off, I will admit that I haven’t read the book. 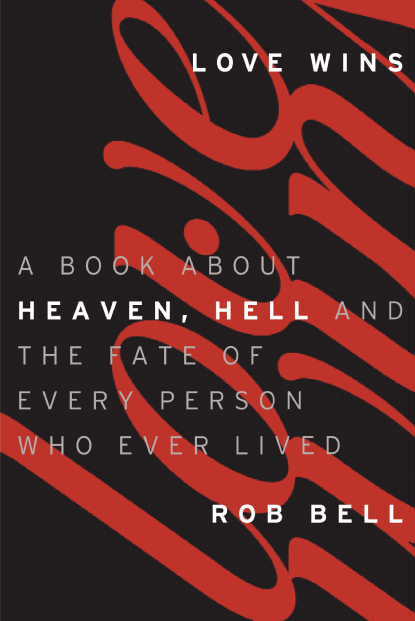 Second, strictly from what I know of Rob Bell and from what I have heard of this book, it makes me question where the progressive church is headed. Is God love? Yes. Does he love each of us indescribably? Absolutely. Does that mean that we all deserve to be with him forever? No. Hell may not be a huge lake of fire that we are continuously swallowed into, but to say that if God loves us, he wouldn’t punish us by sending us to hell is missing the point. First, God isn’t the one sending us to hell. We are the ones sending ourselves to hell. He offered a gift, and if we don’t take it, he doesn’t force us to. One of the comments above mentioned young children in third world countries who died before they were given a chance to accept Christ. I fully believe that their soles go to heaven. I think those who are damned to hell are those who were offered the reward, and continually rejected it. That said, God is not punishing us with hell. God is allowing us to CHOOSE hell. Sounds crazy, but he is saying that if we want to have eternal life with him, it is a free gift, regardless of human works, and the alternative is eternity apart from him, regardless of what that may look like. We all deserve hell…Mother Teresa, Osama bin Laden, me, you, Barack Obama, Rob Bell, and anyone else you can name…living a “good life” does not get us in to heaven. Works don’t work. We are all just as evil as the other person. Jesus’ death on the cross gives us a choice to not face the punishment that we have earned. I think you’ll find that if you read the book, your concerns are addressed. Choice is the emphasized point throughout the entire book. I have to say that I’m halfway through the book, and I don’t know completely what Bell’s entire view is, yet. I really think that he’s less concerned with the reader buying into his view than asking questions and studying it out, and having discussions just like this. See, I disagree. Simply because a sentence does not end with a period does not mean a statement isn’t being made. Bell doesn’t seem to just be asking questions and hashing out an important topic. If he were, he wouldn’t treat the orthodox Christian view with such disdain. I’ve not yet read Rob’s latest book, so I will just share what I’m hearing through several of the recent comments. One thought is a misunderstanding of the nature of God. I hear a constant drum of “God SENDING people to hell.” Questions are good….as long as they are good questions. The real question, based on the gospel presented in Romans, is how can God save anyone? His nature repels sin as light repels darkness. It’s not a decision He makes on a case by case basis. God is love (agape love is not an emotion, it is a decision) but, also, God is Truth. Jesus said He came to testify to the Truth. He told us He is the Way, the Truth, and the Life. Be careful to not quickly dismiss 2,000 years of solid biblical scholarship for the latest idea to come down the pike. Orthoxy is not a metaphor for skubala. I’m all for openmindedness…and searching for more God’s truths, but let’s hold up every new idea to the backdrop of scripture. God’s word is truth. One thing I’d like to point out is that one of the very first things that Bell mentions in the book is that he is not introducing any new ideas. But rather, sharing some thoughts that have always had a seat at the table of Chrstianity – for over 2,000 years. I can only speak for myself on this. But I’m enjoying the challenge of a different perspective. If you ever do read the book please do come by and share your thoughts. So what if he’s not introducing new ideas? Old bad ideas are just as useless as new bad ideas. And it is a stretch to say that the particular flavor of universalism Bell is espousing has “always had a seat at the table of Christianity.” It would be like saying the idea that Jesus wasn’t actually God has always had a seat at the table of Christianity. Of course, Bell provides no citations for these claims. The ones he did provide (i.e. Luther), turn out to be bunk. We just read it differently friend. I have yet to read anything that really contradicts the core of my faith. Which, I guess then, will raise questions for some as to whether or not I’m really a Christian. Doesn’t bother me much I suppose. And I’m not saying you don’t have every right to decide for yourself. Absolutely. I just want it to be known that Bell’s claim that his ideas have been around for a long time are meant to communicate they’ve always been accepted, too, and that’s just bad history. I can’t change what you or Bell believes, but I can make sure facts aren’t being distorted in the process. Would you be willing to share some citations that demonstrate how Bell’s assertions were rejected by the majority of the church historically? I’m not saying they were or weren’t. Frankly, I simply do not know it to be true or untrue. No doubt. And certainly there are some sitting next to the stinky cousin. The question is whether there is anything that can exclude someone from the table. I don’t think Bell thinks so. Do you? I’m reserving comment until I’ve read the entire book. Otherwise I’m speculating about what Rob may or may not say. But I do have a hunch based on this, and some of his other teachings, that I won’t be able to go all the way with him. Wherever it is he ends up in this book. I also think it’s worth pointing out that the only people using the term “God sending people to hell” in the comments thus far, as far as I can tell anyway, are those defending a more conservative/Reformed/whatever-you-want-to-call-it-view. That’s true. But why is this brought up? I’m confused! Pastor Hawkins brought it up and seemed to attribute it to those willing to explore and even embrace Bell’s version of the heaven/hell story. Regarding pulling together citations that show Bell’s claims, false. Absolutely. Just give me some time to pull it all together. Obviously not saying what Bell purports. I have to say that I grew up with quite a few older sources that agree with at least the how hell is defined section of the book. Maybe I’ll stop being lazy and find them. One that I can think of off hand is C.S. Lewis, but I don’t know that he ever spells that out as a belief (other than his allegorical The Great Divorce). Shane, I too think that I will most likely disagree with Rob on certain points (I have always disagreed with him on certain things, more in his books than in his sermons). Interesting that the “sending of people to hell” was never part of the picture from my parent who espouses the eternal punishment view, but that people send themselves to hell. The idea of God condemning or damning people did not come into my consciousness until going to an Assemblies of God youth group in high school. Ezek 31:16 I made the nations to shake at the sound of his fall, when I cast him down to hell with them that descend into the pit: and all the trees of Eden, the choice and best of Lebanon, all that drink water, shall be comforted in the nether parts of the earth. Somebody’s doing the casting. Sure sounds like it’s God in these passages. Man’s actions, or rejection of grace, what have you, may provoke it, but the decisive action rests with God. 1. to throw or hurl; fling: The gambler cast the dice. 2. to throw off or away: He cast the advertisement in the wastebasket. 3. to direct (the eye, a glance, etc. ), especially in a cursory manner: She cast her eyes down the page. We both earn hell, sending ourselves there, and God sends us there, as the fair wages of our sinfulness. Fair enough. I can agree that it’s a mutual damning. Mutual Damning would be a great name for a 90’s alt rock group.